Seen as the "original" Scotch by many, the distillery has one of the longest histories in whisky, and a considerable reputation for quality. Glenlivet’s George Smith became the first legal distiller, when he received the first distilling license after the 1823 Excise Act. In doing so, he risked life and limb, as many of his less salubrious distilling neighbours were enraged by his decision to "go straight", and Smith had to carry two pistols for protection! The top selling malt whisky in America, and the second best selling malt in the world, a bottle of Glenlivet can be found in nearly every bar in the world. 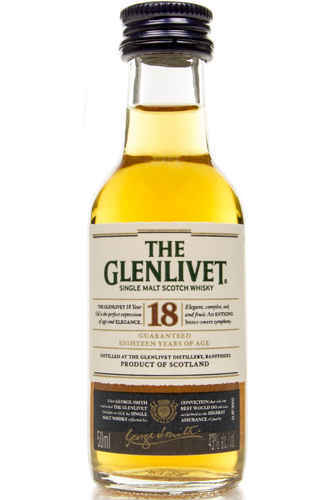 The Glenlivet is a typical Speyside malt whisky with rich notes of biscuit, malt, toffee and tropical fruit. These flavours have enamoured so many, and such is the Glenlivet a byword for quality that the moniker was adopted by many distilleries (including the likes of Macallan!) in an attempt to bask in the glory that Smith’s distillery enjoyed. Legal action was taken, and now distilleries can only use it if it is hyphenated with their own names- something that continues to this day, and demonstrates the Glenlivet’s enduring allure. Glenlivet’s brand succeeded on the back of the ubiquitous 12 year old expression, which has since been replaced by the Founder’s Reserve. That said the distillery’s spirit is also well suited to long-aging, with the rare and extremely collectible Cellar Collection showing off the oldest stocks in the Glenlivet’s archives, whilst independent bottles continue to release Glenlivet whiskies of outstanding age. The Glenlivet is one of the original distilleries, and it is one of the best as well. Distilling begins of the site of Glenlivet, with the illegal farm distilling operation taking the name ‘Upper Drummin’. George Smith inherits the distillery from his father Andrew. George Smith gets his distilling licence after the Excise Act of 1823, becoming the first distiller to do so. William Smith takes charge of Upper Drummin distillery, whilst George Smith proves himself to be something of a whisky entrepreneur, purchasing Delnabo farm, not far from Tomintoul, and Cairngorm Distillery. George Smith purchases the leases of more farms- three in total- including one named Minmore upon the banks of the river Livet. John Gordon Smith moves back to his home to help his father’s business, after his brother William gets tuberculosis. By this point Smith’s Glenlivet whisky brand was rising steadily in popularity and sales, but both the Upper Drummin and Cairngorm distilleries were able to meet the demand. Both Upper Drummin and Cairngorm distilleries are running at full strength, producing as much whisky as they can. Yet this proved expensive and difficult to manage, and Smith still was not satisfying demand for his whisky. Upper Drummin (which was partly destroyed by a fire) and Cairngorm distilleries are closed, and all the equipment salvaged is brought to the Minmore farm, whilst the distillery is named after its product- Glenlivet! George Smith demonstrates his business acumen again, by enlisting renown whisky agent Andrew P. Usher to export his whisky with considerable success. Over 50 years after setting up the distilling operation that would become Glenlivet, George Smith dies, with John Gordon taking up the mantle of manager. Due to Smith’s quality product and clever marketing moves meant that the Glenlivet had a well established reputation for quality, such that many distilleries adopted the term "Glenlivet" in their name, even if they had no connection at all to the Livet valley. In response to the flagrant misuse of the distillery’s name John Smith gains sole rights to the Glenlivet name. This means that all other distilleries have to hyphenate it with their own brand names. A fire ravages the distillery, and several buildings have to be rebuilt. The distillery recovered however, and new stills were installed, expanding the capacity in response to the ‘whisky boom’ of the late 19th century (which arose after a blight destroyed much of the grape crop, devastating the brandy and wine productions. John Gordon Smith dies, after overseeing a great period of success in the distillery history. Three years later, George Smith Grant – the nephew of John Gordon – took over the running of the family concern. George Smith’s son, Captain Bill Smith Grant, becomes the distillery manager. The Great Depression bites, but the distillery manages to remain open, just as it did during another worldwide calamity- the First World War. The Glenlivet distillery is mothballed for the first time, by government decree, as all grain was needed to be saved for food during the Second World War. In a bid to kickstart the post-war British economy, the government lift the ban on distilling, as whisky was an ideal product- unique to Britain and in high demand world-wide. Yet, this required the extension of bread rations, to ensure that distillers had access to the grain they needed. In 1947 whisky distilling returned to its pre-war capacity. The company that owned Glenlivet, George & J. G. Smith Ltd., merges with the owners of the Glen Grant distillery, J. & J. Grant of Glen Grant Distillery, forming the company Glenlivet & Glen Grant Distillers Ltd. The distillery ends the practice of floor malting. The Glenlivet & Glen Grant Distillers Ltd. joins forces with the company that owned the Longmorn distillery, Longmorn-Glenlivet Distilleries Ltd. and another company named Hill Thomson & Co., to form the Glenlivet Distillers Ltd.
A visitor centre at the distillery’s home in Speyside opens, whilst Canadian drinks giants Seagrams purchase the Glenlivet Distillers Ltd. and thus the distillery. The Glenlivet visitor centre expands, including a multimedia facility. The distillery marks the new millennium by releasing two finished versions of their 12 year old, the French Oak and the American Oak. Seagrams is purchased by Pernod Ricard and Diageo, with Pernod Ricard taking over the ‘Chivas-Glenlivet group’. One of Glenlivet’s cult bottlings, the Nadurra 16 year old, is released on the travel retail market for the first time. 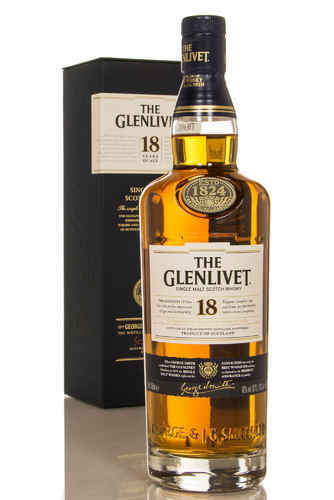 This is a non-chill-filtered and matured in first fill bourbon casks- offering a great example of Glenlivet’s spirit. One of the Glenlivet’s most collectible bottles is also released, the 1972 Cellar Collection, with just over 2000 bottles available world-wide. The Nadurra gets bumped up to cask strength and is released to the general market, whilst the 1969 Cellar Collection also hits the shelves. Over three million bottles of Glenlivet whisky are sold this year- the first time it achieved such a feat. The Glenlivet 25, styled ‘XXV’ is released, instantly becoming one of the best bottlings produced by the distillery, and highly sought after. A new mashtun, eight new washbacks, and six new stills are introduced as part of a distillery expansion, opened by the Prince of Wales, Prince Charles. These means that the Glenlivet’s capacity is increased by a huge 75%. Bottle sales reach 6 million a year.